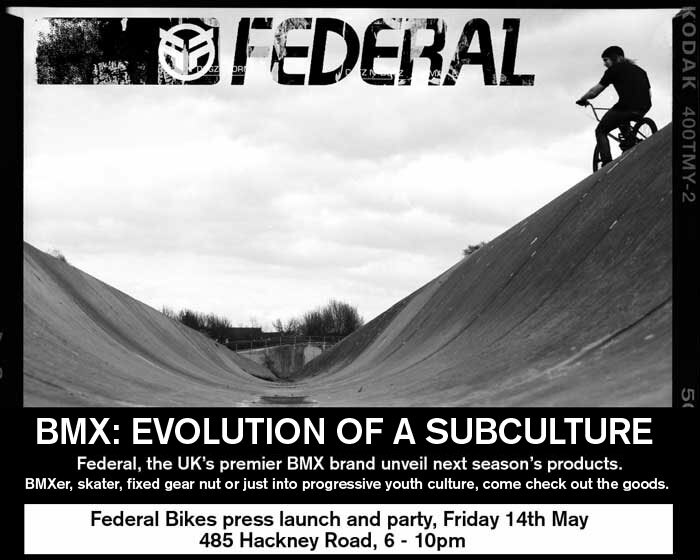 Posy and I are organising a press launch and party for Federal Bikes. It takes place next Friday, the 14th May on Hackney Road and naturally there will be free beer. You can also check out Federal’s new line including signature frames from Ty Morrow and Dan Lacey plus we’ll have some videos showing and whatnot. It’ll be interesting to see how much crossover there will be in the future between BMX companies and fixed consumers. I know for a fact that a large percentage of BMXers hate fixed gear (riders) so it’s amusing to me that some of the BMX companies now make fixed specific stuff. With Charge‘s new Scissor frame due for release at the end of the year with it’s mid bb for running BMX cranks, these guys will be getting more of our bucks. Makes sounds business sense for them to get involved! Anyway, Im waffling. Come down to the party to check out the goods! Unofficial after party at the Birdcage so you can get your karaoke on. Bagsy Patsy Cline’s Crazy or I’ll cry.